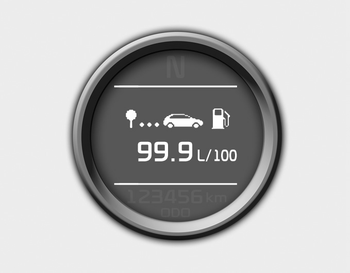 This mode calculates the average fuel consumption from the total fuel used and the distance since the last average fuel economy reset. The total fuel used is calculated from the fuel consumption input. For an accurate calculation, drive more than 50 m (0.03 miles). If the vehicle speed exceeds 1 km/h after refueling more than 6 l, the average fuel consumption will be cleared to zero (---). Pressing the button for more than 1 second, when the average fuel consumption is displayed, clears the average fuel consumption to zero (--.-).